Image Size: 5"w x 2"h.
"This thoughtful and reflective Blackfeet woman can only be dreaming of something or someone special. Caught by the sun, her spirit shines for us. Birds take flight…and mirror her own reflection." Do you see the eagle’s head hidden in the feather? Bev Doolittle’s phenomenal success has been a by-product of her desire to work hard at what she loves to do most – create art with meaning. “My love for nature, as well as man’s relationship with it, is the driving force behind all of my artwork. Painting is a growth process. By giving each of my pursuits my best effort, and by learning from my mistakes, doors have opened for me that I could not have anticipated.” For Bev, one of those doors was with The Greenwich Workshop, who produced her first limited edition print, Pintos, in 1979. It sold out at the publisher within weeks. “I am not a prolific painter,” Bev explains. “My art style prevents that. Reproducing my painting in print was the perfect answer. I was able to concentrate on my most important ideas while still having my work represented in galleries around North America as well as abroad. My relationship with The Workshop and its extended family of artists, galleries and their customers has been a joy for me for more than twenty-five years.” Nearly all of Bev’s prints have been sell-outs and five books of her art have been released. 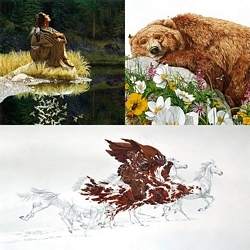 Her first, The Art of Bev Doolittle, is truly a phenomenon, having sold over half-million copies of its hardback edition. Her second book, New Magic, continues the story of her painting career. She has since released three children’s books. The Forest Has Eyes was a hit with readers, both young and old. It was followed by Reading the Wild. Her illustrated novel for young readers, The Earth is My Mother includes dozens of drawings and paintings, four of which were released in print. Her desire to try new mediums as well as her fascination with sculpture, led to the creation of five limited edition porcelain boxes, each featuring one of her most popular paintings. In 2004, after a five year hiatus, Bev returned to the print art in the form of original, hand-pulled, stone lithographs. With some editions set at fewer than 20 pieces, these original prints are already rare. Bev’s work reflects her love of horses, passion for the natural world and her affinity for the Native American’s spiritual relationship to the land. Her work can also be found on calendars, journals and note cards. Bev and her husband, Jay, both graduates of the Art Center College of Design, began married life as art directors for an advertising agency in Los Angeles. Five year of living in the city made them more aware of what they were missing: the outdoors and creating their own art. “We hoarded our savings and struck out on our own, living out of our camper for a year. Calling ourselves, ‘Traveling Artists,’ we painted our way through the western United States, western Canada and Baja, California. It was a tremendous grown period for me. I not only developed my painting skills, but I discovered that I possessed enough self-discipline to paint every day.” Afterward, they displayed their work in malls and outdoor art venues. “Yes, we were ‘starving artists’ for awhile!” admits Bev with a grin, “But, we were so happy doing what we loved.” Life is full of hard choices and the path of the artist is no different. “My advice to aspiring artists is simple: paint what you know, paint what you love and always paint for yourself!” For me, success followed my passion. Passion is what drives me.” Bev, Jay and their son Jayson live close to nature in the California high desert. Joshua Tree National Park is their backyard.